Alternative practitioners are part of the team to keep our equines healthy and happy. If you have something to offer to improve the wellbeing of horses and ponies, please contact me. I would be happy to list you here. Woodend, but will travel. Phone consultations. (servicing Warrnambool and districts, will travel) Over 12 years experience . Zarna Carter, qualified Homoeopath, Herbalist and Ortho-Bionomy® practitioner. 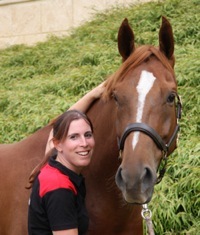 Zarna teaches Equine Positional Release classes, working with horses in Australia, New Zealand and the United States. Acupuncture, Herbal Medicine, Flower Essences, Seminars. the professional Student, Horse Owner and Veterinarian. Years of experience in the field and in the class room have brought us to this learning platform. We are proud to offer you cutting edge information in an appealing format. Please feel free to contact us with any questions you may have.